Amalia and Nicolas chill out between book signings. Photo by Eleni Gage. It's hard enough to travel on vacation with kids. But to travel on business with a newborn and a toddler? Alone? We give out gold stars to those intrepid folks. 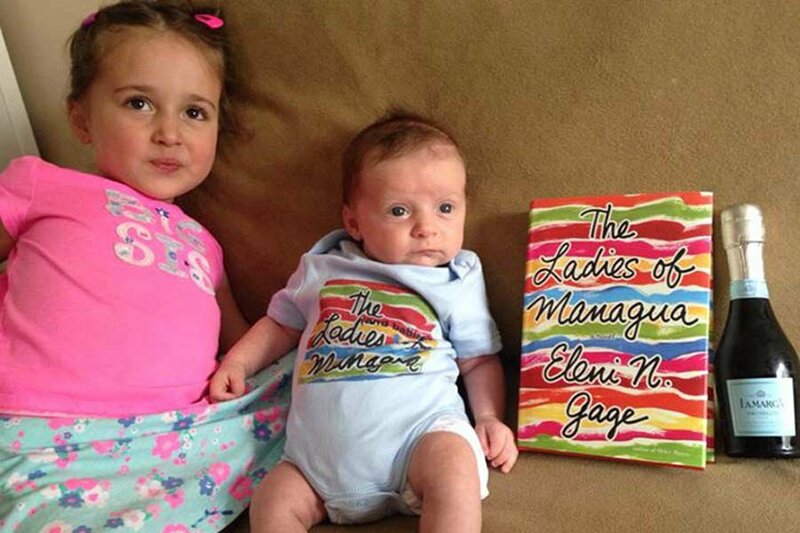 Author Eleni N. Gage, author of The Ladies of Managua, relays her travel fiasco from New York to New Orleans to Miami and back home. LAGUARDIA AIRPORT – I thought I had planned everything perfectly. But one of the things travel and motherhood have in common is that nothing ever goes as planned. When I did the math and confirmed that my novel, The Ladies of Managua, would be published while I was on maternity leave, I realized I'd be able to set up a book tour, something which would have been nearly impossible at any other time, given my full-time job as a magazine editor. For the first third of my three-month leave, I figured, I'd sit at home, recovering, breastfeeding, and staring into the eyes of newborn Nicolas. In the second month, I'd bring him and his three-and-a-half-year-old big sister, Amalia, with me from New York to New Orleans and Miami, both of which are settings for the novel, for book events. Again, perfect timing! I'd forgotten the cardinal rule of parenting: Just when you think you've got this motherhood thing down, someone is guaranteed to poop all over your white jeans. As my book tour approached, I found myself right back on that parenting roller coaster, hurtling up peaks and down valleys. The new baby was a great eater: peak! But I now had mammoth, grandma-like 32E breasts and a gut that celeb moms such as Heidi Klum, who walked the runway for Victoria's Secret shortly after giving birth, would never recognize: valley. I finally found a dress (that concealed unloved body parts), to wear to every single book event: peak! While at my launch party, it was not wine but someone's breast milk that spilled on said dress: valley. When it came time to leave town for my event in New Orleans, the baby was in a feeding groove, and I felt invincible. Until people began to suggest that maybe I was just insensitive. Nicolas was only six weeks old, and my aunt wondered why I insisted on dragging the kids all over creation. "Babies aren't easy to come by," she said. "Enjoy yours. Spend time with your kids instead of chasing money." Clearly, she knows nothing about publishing. The book tour was unlikely to bring me vast riches. But I wanted to give the book, which I'd been working on since Amalia was a year old, more visibility and to show my children, especially Amalia, that work you love matters. But was I making their lives more stressful in the bargain? On the flight from LaGuardia to Miami, I carried Nicolas in a shirt made with a pouch for baby-wearing. Rocked to sleep by the motion and white noise of the plane, he slept the entire flight. Upon arrival, we learned that, after a long illness, my grandfather-in-law had passed away. My husband left for Nicaragua to attend the funeral the next morning and I stayed behind with Nicolas, whose passport had yet to arrive. En route to Miami alone, I tended to a screaming baby all through airport security at New Orleans airport (it lasted about 45 minutes). Older women corrected the way I held the baby, younger women looked horrified, and men averted their eyes in terror. When we arrived at my parents' apartment in Miami after midnight, I was covered in breast milk (mine), urine (the baby's), and sweat (who knows). All I wanted to do was shower and throw my clothes in the laundry. The next morning, I woke up clean but without my engagement and wedding rings. My mother and I tore up the house, the beds, and the washing machine looking for them. Then I remembered separating the trash from the recycling in a sleep-deprived haze the night before. My mom, bless her heart, went through the garbage and found my rings stuck to a dirty diaper. Exhausted and filthy, I had thrown out my most valuable pieces of jewelry (both practically and sentimentally). The next day, after my final reading took place at my favorite independent bookstore, I signed books while Amalia drew on paper napkins with the Sharpies the store had provided. As I spoke to the woman in front of me, Amalia turned to the stranger behind her and said, "I'm drawing pictures for my mommy because I'm proud of her. She did a REALLY good job." It was the best moment of my book tour. The events were nice, but the highlights of the trip came from being on the road with my kids, whether we were schmoozing tattooed Cajuns in a French Quarter courtyard, feeding fish in the fountains of Miami Beach's Lincoln Road, or dabbing Nicolas's tiny feet in the ocean for the first time. And even though Amalia threw up on me during the eleven-minute drive to Miami International Airport on the way home and I caught a bug on the flight and was feverish for two days afterwards, I'd do it all over again. Which reminds me of the second cardinal rule of parenting: Traveling with kids is never easy, but it's almost always worth the pain.